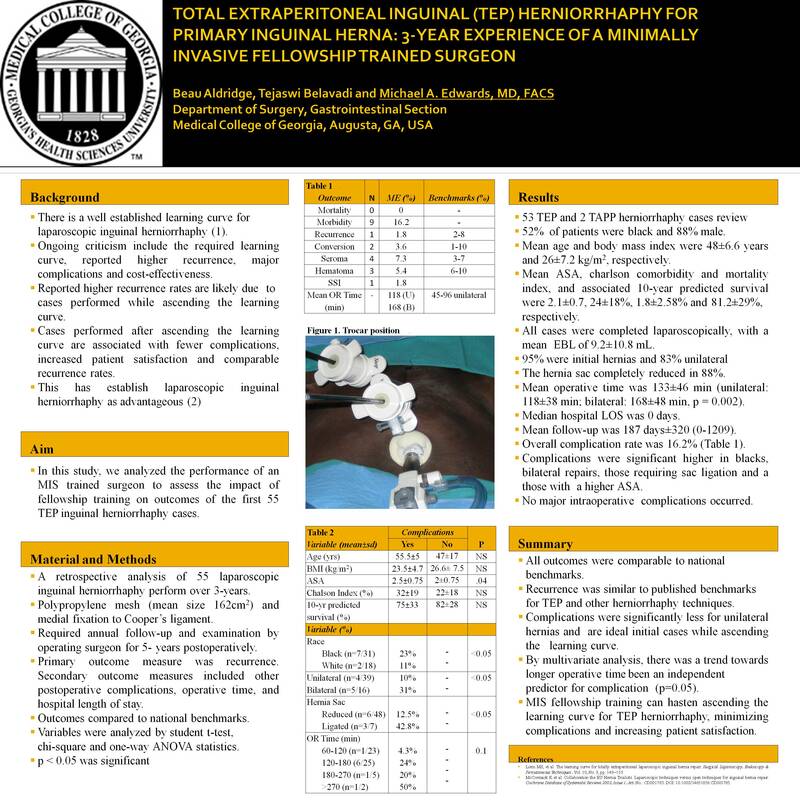 Introduction- The aim of this study is to report the outcomes following TEP repair for primary unilateral inguinal hernias, performed by a single surgeon (ME) with minimally invasive surgical fellowship training. TEP repair for unilateral primary inguinal hernia remains a topic of discussion. Reported higher rates of recurrence are likely due to cases done while ascending the learning curve. We hypothesize that MIS training may reduce the learning curve and yield better operative outcomes. Methods- A retrospective review of the first fifty-five TEP repairs over a 3-year period following fellowship training was conducted. Follow-up protocol included an annual clinical examination by the operating surgeon for up to 5-years. The primary outcome measure was hernia recurrence. Secondary outcome variables included other postoperative complications (hematoma, seroma, urinary retention, and wound complications), hospital length of stay, blood loss and operative time. Outcomes were compared to national benchmarks. Results- 55 TEP repairs were performed between August 2006 and April 2009, including 95% primary and 71% unilateral repairs with a mean follow-up of 99 days (range 0-1086 days). 91% were male and the mean age and body mass index were 49-years and 26 kg/m2, respectively. Mean ASA, 10-year predicted survival by Charlson comorbidity-index and predicted morbidity and mortality by POSSUM scores were 2.1, 81.2%, 23.8% and 1.8%, respectively. Average blood loss was 9 mL. Mean operative time was 129 minutes. There were 2 conversions to a trans-abdominal repair. Median hospital LOS was 0 days. Overall complication rates was 16.4%, including, 6 seroma, 2 hematoma, and 1 superficial skin infection. There was no mortality or recurrence. All outcomes were comparable to national benchmarks (Table) and surgeons with similar training. Discussion- No independent predictors for complications were noted in this series. Recurrence and other complications following TEP were similar to published. As the learning curve impacts surgical outcomes, these less difficult cases (unilateral, primary hernias) may be safer initial cases for the novice surgeons ascending the learning curve compared to the more challenge bilateral and recurrent hernias.